1. I wasn’t paying attention when TJ and his brother, Adam, carried his two couches to the U-Haul. 2. Sitting in the garage with a beer, I was counting the bug bites on my legs, and talking to Adam’s girlfriend, Misty. 3. 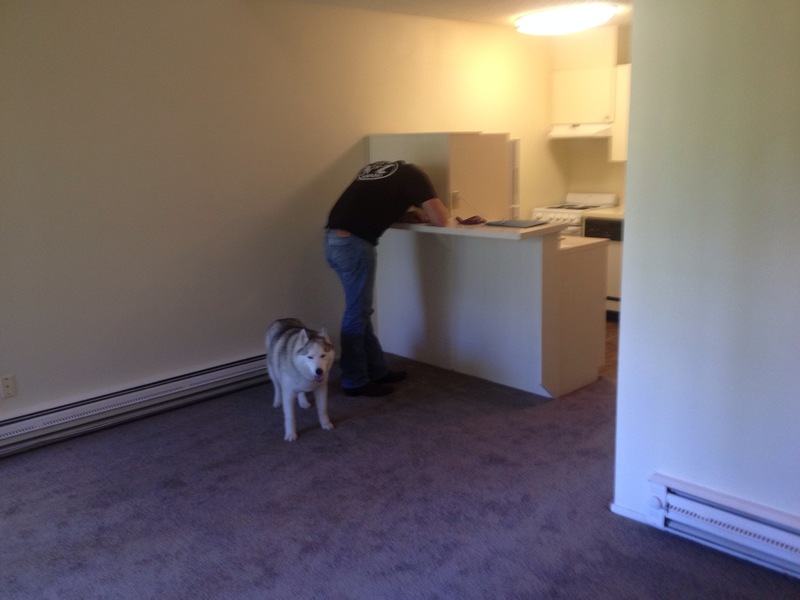 When we arrived at our new apartment & had picked up our keys, we began the never-ending task of unloading our stuff. One U-haul, one car and one truck full of stuff. 4. It was another hot day in Portland. Don’t be fooled. 5. We saved the new mattress, box spring and two couches for last. 6. For some reason I’d conveniently forgotten that most apartments in the PNW don’t have air conditioners. Our apartment had a window unit, way up high, that only blew cool air into the bedroom. It seemed wasteful to turn it on, when we would be coming in and going out and working mostly downstairs. 7. Yes, our small apartment has an upstairs — Loft style. Living room and kitchen on the first floor, then up seven stairs to the bathroom and up seven more stairs to a bedroom that looks down over the rest. It’s an interesting way to save space. 8. The first couch, the love seat, almost killed me. It was heavy, awkwardly shaped and at one point, I had to lift it from waist level to above my head to get it over the stairs’ railing. 9. If you’d asked my 20 Resident Assistants that I worked with last school year whether or not I could lift the second, heavier couch, I think they all would say yes. This is because I’d cultivated an air of badassness, and a confidence that said I could do anything, but chose not to. 10. I was fairly winded when we lowered the love seat against the wall. Swamp crotch was a real issue. I was considering taking off my shorts for the rest of the day. TJ looked concerned, asked if I could lift the second one. 11. I wasn’t sure, but I was pissed that he wasn’t sure. It was a strange moment to recognize that he didn’t see me the way I made sure most people saw me: capable, strong, ready to take on anything. 13. Hell No! I was going to lift that couch if it was the last thing I did, as if lifting this couch was my final legacy. I refocused my grip, pushed from my thighs and made for the stairs. 14. I didn’t make it. We had to stop — resting my side of the couch on a rusted electrical box. 15. I should not have stopped. Putting the couch down meant picking it back up. And I’d have to lift it from knee height, to waist, and then over my head. 16. TJ was silent. I think he was unsure of whether or not tell me to stop, and to find someone stronger who could help. I think he wanted me to say it, so he wouldn’t have to. 17. If you’ve ever watched Anime, which I am not ashamed to say I do, you know how there is the moment when a character Strengthens Their Resolve. The music sudden gets frantic and has a lot of bass. Lighting is striking around the drawn character as he or shee makes some speech about how he or she will not give in. 18. I pretended I was Ichigo Kurosaki from Tite Kubo’s Bleach. The couch came off the electrical box. I grunted. The couch was waist high and we’d made it to the stairs. I knew once we were on the stairs, I could not stop without bringing the couch down on myself. 19. I lifted, the couch bruising my chest. I lifted higher, and rested one sharp edge on my shoulder before lifting again. The couch was up and over the railing. Now up the stairs, one, two, six, seven, TJ was trying to make the turn. 20. There is a moment in the midst of physically challenging activity when your body sends out warning pains. You are on the edge of a dangerous precipice that you could step away from, if you just stop whatever you’re doing. But if you don’t stop, if you continue on, this will lead to either serious injury or provide proof that you are capable of more than you knew. You surprise yourself. You surprise people who know you. You lift the couch and you’re not even sore the next day. Sara, I almost wrote that in but only we would understand. I always tend to move during the hottest or coldest time. It’s like my superpower.